Meter Waterproof Paper is a highly durable range of synthetic paper that is suitable for use in extreme conditions. As well as being 100% Waterproof the product is also grease, oil and dirt proof, and all spills and stains are repelled and do not affect the printed surface. The product could just as easily be known as Tear Proof paper as it is virtually indestructible and is fade and scuff resistant. Meter Waterproof Paper is heat tolerant and has been specifically designed for use in all Laser Printers and Copiers-including high speed Digital Copiers. This remarkable range of products provides a cost effective solution that will both protect your documents and ensure they are long lasting . Uses for Meter Waterproof Paper. There are thousands of applications for Meter Waterproof Paper where printed documents need to withstand extreme environmental conditions and frequent handling in hard use areas such as mines, aquatic centres, diving and defence applications. Suitable for indoor and outdoor uses, due to the product being Weatherproof, users are able to write in the rain on each sheet with a pencil or pen. Meter Waterproof Paper can even be used underwater and is a popular choice with scuba divers. Due to the archival properties of waterproof paper it is also perfect for printing plans and document hard copies that are required to be kept for long periods of time without deterioration. Mining Companies use the product for manuals and MSDS sheets. 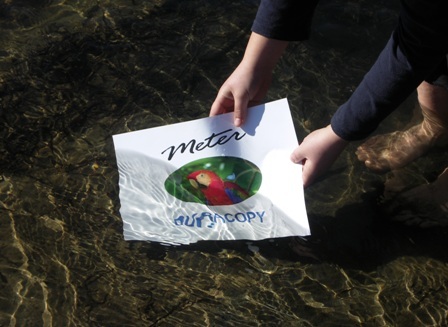 Widely used by Aquatic and Swim Centres, Meter Waterproof Paper also provides a great way to print maps that are used in Orienteering and by Surveyors. • Outdoor Research Sheets – used by Primary Industry and Environment Departments. Apart from the superior durability and tear proof qualities of Meter Waterproof Paper, it is also a cost effective way to print. In many applications it removes the need to laminate paper in order to protect it. This saves on Laminating Film costs and also the time taken by the user to insert a sheet into a laminating pouch and then wait for it to go through the laminator-which is a large labour cost. With Meter Waterproof Paper the user simply prints through any Laser Printer or Copier and the job is done. Laminating can also deteriorate in outdoor applications when exposed to heat and cold due to the glue in the film. Waterproof Paper will last longer and saves having to reprint and re-laminate documents. Offering superior image quality and printability, Meter Waterproof Paper can also be folded, die cut or punched as required. Range of Meter Waterproof Paper. Meter Waterproof Paper is available in boxes of 100 sheets and in A4, A3 and 200 sheets in A5 size. Click on the links below for more information on each item.